Ruby Walsh is aiming to be back riding at the Punchestown Festival later this month after receiving a positive update from a specialist on his broken arm. 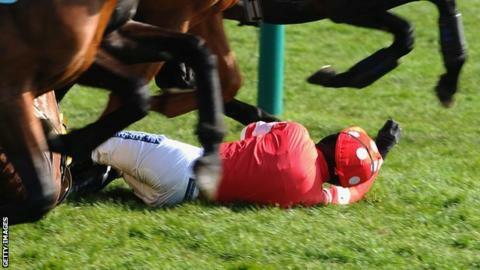 The Irish jockey, 34, dislocated his shoulder and fractured his humerus after a fall at Cheltenham in March. He missed the Grand National and was expected to be out for the rest of the campaign, but is now set to return. "Hopefully he'll be back riding out in a fortnight and we'll go from there," sister and agent Jennifer Walsh said. The jockey attended the Sports Surgery Clinic in Santry on Monday and with his injuries healing faster than expected he is aiming to be back in the saddle for the opening day of the Irish racing festival on 29 April. "The specialist was happy when he went to see him on Monday and hopefully he'll be back for Punchestown," said Jennifer Walsh. It is no surprise Walsh is keen to get back for Ireland's showpiece event given his high-profile rides could include Vautour, Faugheen, Quevega, Hurricane Fly and Champagne Fever.